Believe it or not, this thing is an actual toy blimp in a box. Now, it actually doesn't go up, so manual, fun "labor" is involved. But kids will have loads of fun physically playing with the blimp rather than just the online version (www.poptropica.com). Now don't get me wrong, the website is fantastic and full of engaging quests, stories and games for your child. Check both out why don't ya! Travel to the edges of Poptropica and beyond with your own inflatable, 30-inch Poptropica blimp. 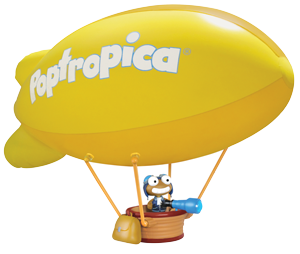 Players who get the Poptropica blimp will unlock an exclusive in-game adventure! For ages 6+ and retails for $29.99.